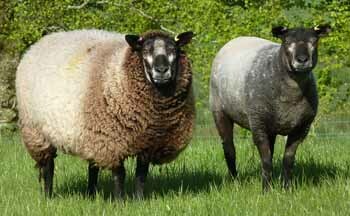 We still have a few shearling ewe fleeces available and suitable for spinners, weavers and feltmakers. This year's fleeces were exceptional – we were very lucky with the weather at clipping time. The day before was showery in the morning followed by a dry breezy afternoon and a lovely warm morning before these shearling ewes were clipped in the afternoon. It is always good to get (unprompted) feedback and here are three of the messages that we have received from spinners and weavers in different parts of the country….. The wool also felts very well and the lighter greys dye successfully giving distinctive speckly hues. The fleeces are quite substantial many around 4 – 4.5 Kgs. and with a range of greys. 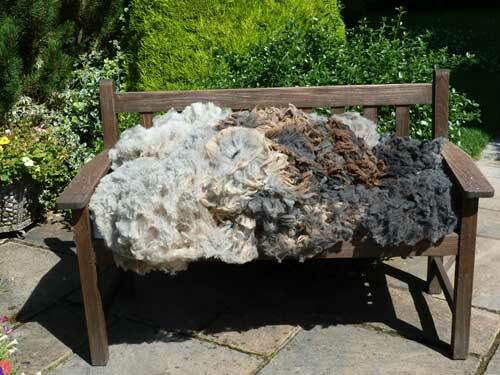 This photo shows one fleece laid out on the garden seat portraying the lovely range of colours. We still have a few of these special fleeces left so contact Jennifer quickly to avoid disappointment if you'd like one of them. We also have some of the carded batts mentioned in the comments above. We also have Blue Texel wool that has already been professionally carded into batts and is ready for spinning or feltmaking. The beautiful colours as they emerge during clipping. This shows the before and after!